- Open and save SHP (TS) and SHP (TD) files. - Basic brush, selection and shape tools. - Active and Background colours, for left and right clicked painting. 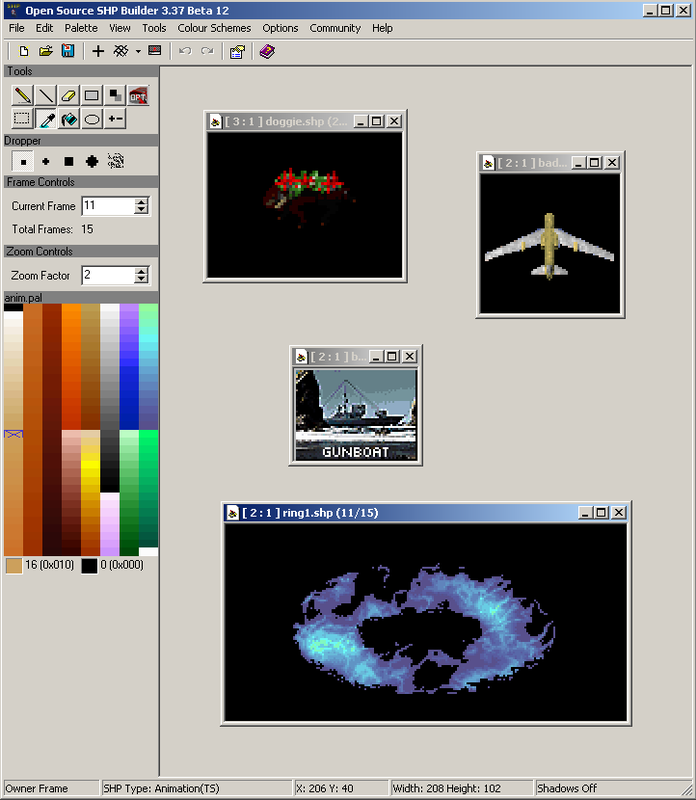 - Advanced and fast reliable recolouring systems, including Pal Pack instant recolouring system implemented in the program. - Easily imports .BMP, .JPG, .PCX, .GIF, .PNG and .TGA into SHP (TS) or SHP (TD). - Building Brush Tools that aids on creating realistic snow, dirt and damage effects. - Special flood and fill for faster and smoother recolouring. - An advanced, efficient and exclusive Cameo Generator that allow the creation of high quality cameos for TD, RA1, TS and RA2 in seconds. - An exclusive and helpful Sequence Maker that aids on finding the art.ini settings for your infantry sequence. - Basic copy, paste and moving abilities (with transparency), allowing you to paste as new frames and images. - Massive frame copying, moving, deleting, reversing, mirroring and flip abilities. - Ability to resize the image through pixels or canvas. - Ability to split a frame in several smaller frames. You can also export sprite sheets. - Tools adapted to TD, RA1, TS and RA2 modders avoiding misuse of colours. - Features the undo, in case you do something wrong. - Flexibility, allowing users to make their own recolouring scripts and deals with custom palettes. - Has community links, linking you to the best TD/RA1TS/RA2 sites in the web. Also, linking The First Decade solutions and community goodies. It's also customizable, in case you need to add your own link and spread it around. - An user friendly Help File that explains the features of the program. And the source code of the program is available for everyone analyse, learn and edit it. You may require to download additional files when you run the program for the first time. If you don't trust the program's installer, you can download the files straight from the SVN. Suppport for this tool is located at HERE. Make sure you mention your forum nickname. This is crucial. And also, one feature that you'd need. You'll receive a response and if that feature is not viable, you can request another one.